This dish almost seems like an extension of the riddle one learnt as a child. There is a big green house, inside it there is a big brown house, inside the big brown house there is a big white house and right in the middle there is a pool. The answer is " (Tender) Coconut". Replace the pool with some succulent marinated prawns, bake them for an hour. Voila! your dish is done. I am super duper excited today. So much so that I have started writing the post even before the verdict is out. 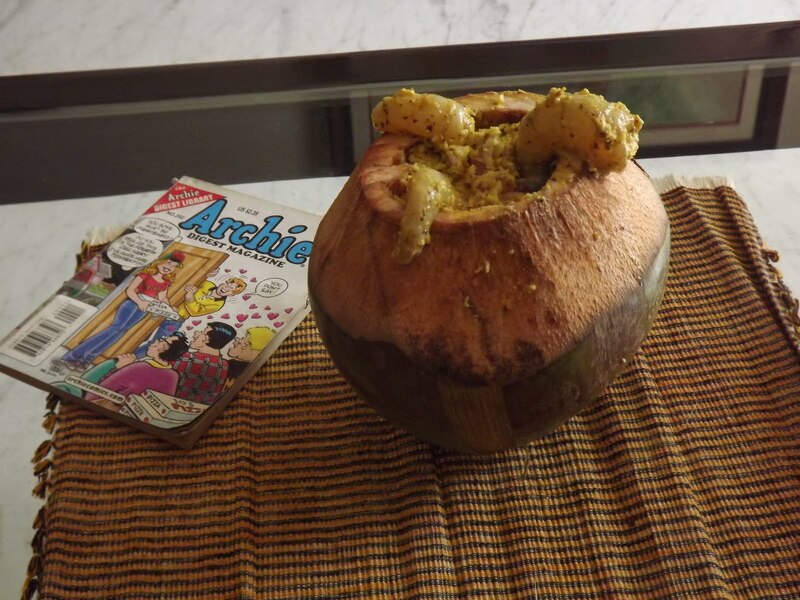 Making Daab Chingri(Prawns cooked in tender coconut shell) has been on my wish list for a while now. It looks and sounds so exotic. With an ingredient list that sounds deceptively similar to of 'mustard prawn' it can't possibly taste very different( vetted by personal experience). However this is one dish where the journey is undoubtedly more enjoyable than the dish itself. There is a lot of excitement around preparing it. Even the staged photo shoot lasts much longer. The prep work starts with hunting for " Tender coconut". Not as easily available post the scorching summer. Not always available at the neighborhood vegetable shops, typically the push- cart seller carries it. And then you have to get the vendor to scrape the top( this allows the heat in) , make a cut on top and slice a little bit from the bottom to help the tender coconut balance itself( for an extra fee of course). 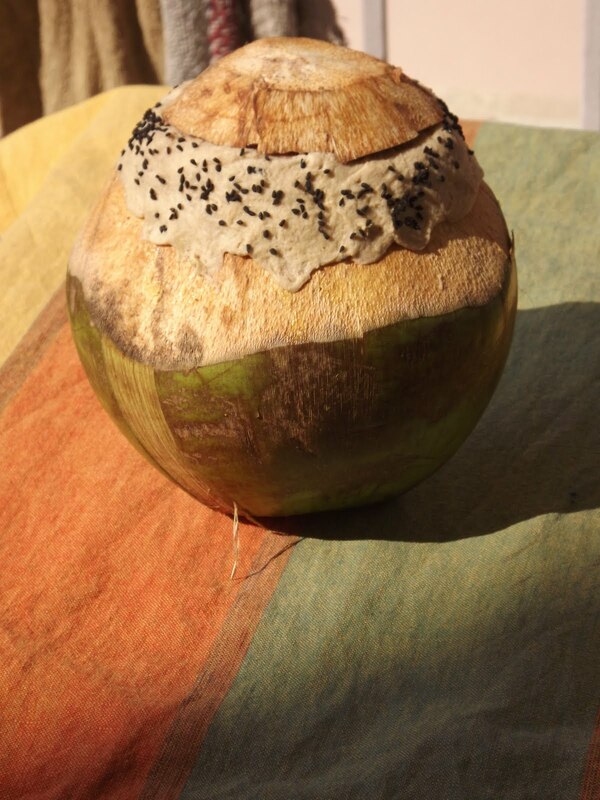 Drink the coconut water- you could save a little to add to the marinade- save the shell for the dish that follows. Tender Coconut: Choose one that will fit into your oven. Scrape the top of the tender coconut. Cut out the top(retain it as you need it later). Stuff the prawn marinade into the tender coconut, do not pack it tight. Put the lid back, seal with dough to make it airtight. Decorate with some kalonji- contrasts well with the off white dough and adds to the visual appeal. The prawns have been baking for close to forty five minutes now. The tender coconut shell has turned dark brown. The dough sealing top has dried up and tightened around the top. Fifteen more minutes to go. Table has been set. Rice is done. So baited breath it is. Just sampled the dish. Really succulent, juicy prawns with a hint of tender coconut. Went well with the otherwise simple meal of rice and daal. Plan to try a variation where I reduce the quantity of mustard and add some tender coconut to enhance the flavour. This is one of those dishes when placed in front of guests makes them first gasp and then go Wow! Truly exotic i must say and i salute your patience!! 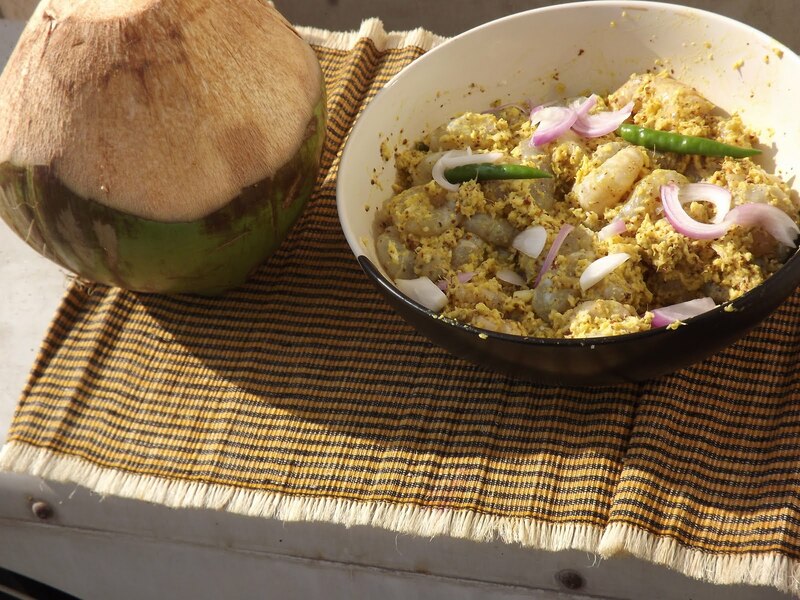 but tell me what happens to the tender coconut inside, do you scrape it our along with the prawns while serving? Thanks for the kind words. I happened to just see your comment. Will definitely add the blog to Petitchef. The more people who try out the dish the merrier.